Check out these great Jupiter real estate listings or scroll down to read about Jupiter, view demographics and learn about Jupiter schools. Call (561) 322-3330 to speak to a Jupiter realtor now! Check out the latest Jupiter statistics available, including crime rates, cost comparisons and population growth. Call (561) 322-3330 to speak to a Jupiter realtor and specialist now. Jupiter is located in Palm Beach County and is the northernmost part of the county. It is north of Juno Beach and south of Tequesta. It is east of I95 and west of the Atlantic Ocean. It is oceanfront and has an ocean inlet. It is 21.1 square miles, of which 20 square miles are land and 1.1 are water. In 2012, it was rated number 9 for "Happiest Seaside Towns in America" by Coastal Living Magazine. Its symbol is the lighthouse as that is its most notable feature. The lighthouse was built in 1860 and has been listed on the National Register of Historic Places since 1973. The city was named after the Hobe Indians, who lived near the mouth of the Loxahatchee River. Spanish mapmakers pronounced Hobe as Jobe but mistakenly recorded it as Jove. Later mapmakers assumed that Jove was latin for the Roman god Jupiter and changed the name accordingly. 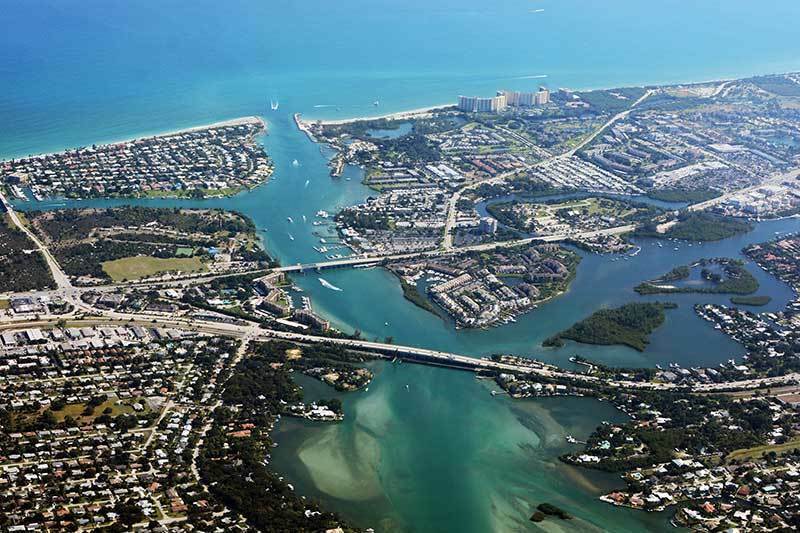 It is a great place to visit and a lovely place to live, offering both oceanfront and intercoastal living as well as golf residences. Residents can choose from homes, townhomes, villas and condominiums, both in gated and ungated communities. The city is home to Roger Dean Stadium, Florida Atlantic University's MacArthur Campus, Palm Beach International Raceway, William P Gwinn Airport, Busch Wildlife Sanctuary and Scripps Research Institute. In the center of the city lies Abacoa, a planned community offering 11 different neighborhoods and a Town Center with restaurants and shops.Call (561) 322-3330 to speak to a Jupiter realtor and specialist about Jupiter homes for sale, commercial and investment property, Jupiter real estate and rental apartments or scroll down to learn about Jupiter schools, statistics and demographics. Use the links below to explore Jupiter homes for sale and real estate in these great Jupiter communities or call (561) 322-3330 to speak with an Jupiter realtor. Our professional RE/MAX realtors are standing by waiting to help you now. Use the links above to view homes for sale in these Jupiter communities or call (561) 322-3330 now to speak with a Jupiter realtor and specialist. A professional RE/MAX realtor is standing by waiting to help you. Learn more about Jupiter schools, complete with school ratings and contact information.